I arrived on my post today by way of jetlag! Last Sunday I arrived back at my home in Switzerland from my home in Australia. After two months of long summer days, I was back into sub-zero temperatures, flurries of snow and short winter days. The 10 hours of time difference is difficult to get over and after having woken up at midnight for a couple of days, I managed to sleep until 3 am last night. My nights have been filled with Carnatic Music and this morning it was the poetry of the extraordinary Subramanya Bharathi which kept me enthralled. And as I said, I arrived at Dikku Teriyada Kattil for my post today. I grew tired in my search for you. In this metaphoric poem, Bharathi likens life to a forest in which our soul is lost, forever searching for the Divine. This beautiful poem is sung by Carnatic musicians in different ragas. The most popular version is a Ragamalika – a string of different ragas – as sung originally by the great maestro G.N.Balasubramaniam. Only a subset of the verses are sung normally. when a lustful hunter stared at me to my embarrassment. ‘”Girl, I am maddened by your beauty!” he said and laughed. In other unsung verses, the hunter goes on to ask the heroine to lie with him, to eat and drink and make merry. Thus do dangers come to seduce us, implies the poet. There are passive dangers, like the lions and snakes the poet mentions as he sets the scene but also active dangers, like the hunter who intends to harm by way of pleasure. Elder brother, I fall at your feet, do not say such cruel things to frighten me! Is it correct to even to look in such a way at a woman who is married to another? Who is the soul married to? Who but God himself! Our scriptures often portray the jeevatma (soul) as feminine and the paramatma (God) as masculine. The two are tied by sacred bonds as if they were wed.
‘”Don’t speak of rules! I seek only your pleasure, my sweet! The hunter seeks pleasure, willing the girl to betray her principles. It is interesting that the poet has the hunter seeking her pleasure, not his. Is that the ultimate seduction? The most irresistible temptation is an offer of pleasure, is it not? ‘Hearing these words, I cried out ‘Kanna’ and fell. 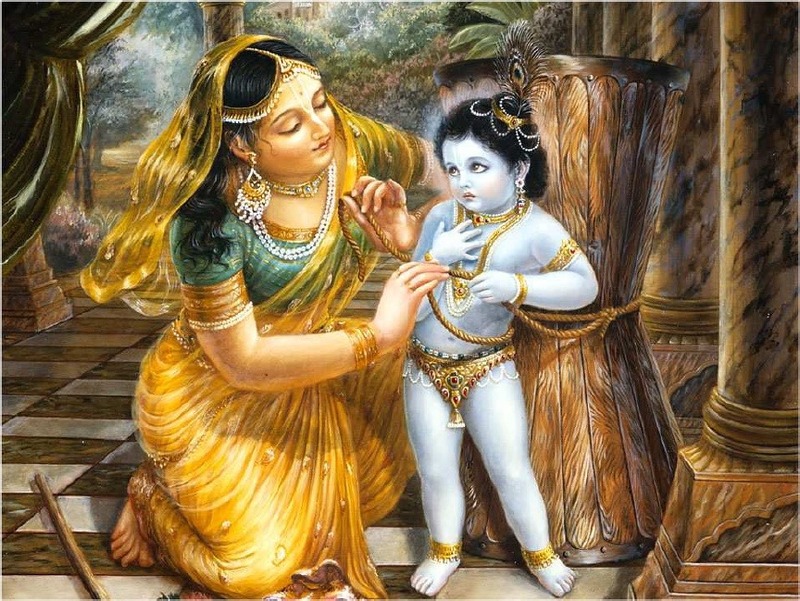 Kannan is the name of Lord Krishna, but it is also means beloved. For her, both are the same. The poet seems to say that when we are seduced by the illicit pleasures of the world, we need only take the name of our Lord and He will come to save us. It is fascinating that in the version sung by GNB the words are altered slightly. He sings ‘I cried out ‘Kanna’ and leapt to embrace him’ !! Here the hunter is implied to be the Lord in disguise. A small change, but how it changes the story! To those lost in this world, the only true seducer can be the Lord for what can more seductive than an offer of love from Him? There is yet another interpretation, that the girl was asleep from when fatigue made her drowsy to the time she woke up and saw ‘Him’. The poet may be implying that life is like a dream, all its pleasures and dangers a mirage and that one day we will wake from it to see the Lord. This song appeals to me on multiple levels. The imagery is charming; a girl lost in the forest, not frightened but amazed at the world in which she finds herself. Accosted by a hunter, the world suddenly becomes a frightening place because her virtue is at stake. Great imagery! On another level, the metaphor makes sense to me and keeps me thinking. On a third level, I love the sound of the words which flow so elegantly, Tamil at its very best. On yet another level, I love the ragas the song has been set to, each verse infused with its own mood. It starts with Behag, lilting and light as she traipses through the forest. As she tires, we switch to Revagupti, a gentle and somnolent raga. The hunter seduces in Kuntalavarali and she begs him for mercy in Sahana. He talks cheerfully of his intoxication in Kapi and she loses consciousness in Paras. A gem of a song. This song was so much owned by G.N.Balasubramaniam that it would be a travesty to offer any other rendition. I found this rather light, filmy version on youtube which I hope you enjoy. For an instrumental version, listen to the great violinist T.N.Krishnan. Is it correct to even to look in such a way at a woman married to another? ”Don’t speak of rules! I seek only your pleasure, my sweet! Hearing these words, I cried out ‘Kanna’ and fell. alternate : Hearing these words, I cried out ‘Kanna’ and leapt to embrace him. Before long my faintness cleared and I woke to see You! Alas, I have forgotten that beloved face! To whom shall I talk of it my friend? When my heart has not forgotten the love, how could I have forgotten the face? In my mind I see a form, yet it does not have the full beauty of Kannan And when I have a glimpse of a befitting face, I see not his beautiful smile. Ah the sins that my eyes have committed that I have forgotten the form of my dearest Kannan! Amongst the ladies, have you seen someone as naive as me? I don’t even have a colour portrait of Him, how will I live now? Memory. Today I have landed upon this rather unusual topic for Carnatic Music. For people of my age group, growing into the autumn years of our lives, memory is an especially interesting topic given how often it fails us! Is it not interesting that we remember emotions and sensations far better than facts? I have heard it said that emotion helps us retain and retrieve memory. But emotion also colours our memories so that what we consider facts are in all probability very inaccurate perceptions of reality. Actors use what is called sense memory, remembering emotions triggered by a memory of a sense-experience like a smell or a taste. Do we not all remember a favourite dish by our mother or our grandmother, and do we not have a rush of affection for them with the memory? How often do you smell a perfume or incense and get assailed with memories of another time, another place? Yet these memories remain elusive, with an untouchable, dream-like quality. I remember the overwhelming rush of love I felt for my baby as she was put into my arms for the first time, but I cannot remember whether it was night or day. I remember the desolation of hearing that my mom passed away, but I cannot remember the date. I remember the despair of arguments with my husband, but not the reason. Why is our memory so selective? But perhaps our brain is just being smart in remembering the essence of matters rather than the clutter which surrounds them. That brings me to the poetry choice of today. Is it not the cleverness of a poet to write of what we understand and lead us towards what we do not? As I listen to this beautiful song by the extraordinary thinker, activist and poet Subramanya Bharathi (1882-1921), I reflect on his words. Who knows what poets intend? One can only interpret based on our limited understanding of life. ‘Alas, I have forgotten that beloved face!’ laments the poet. ‘ When my heart has not forgotten the love, how could I have forgotten the face?’. The poet talks of his beloved Kannan, Lord Krishna, struggling to remember the form which just eludes him. ‘And when I have a glimpse of a befitting face, I see not his beautiful smile’. We theists, is that what happens to us? Are we remembering the overwhelming love of God yet forgetting His form? ‘Ah the sins that my eyes have committed that I have forgotten the form of my dearest Kannan!’ despairs the poet. ‘Is there a bee which forgets honey? Or a flower which forgets sunlight?’ Should it not be as natural for us to remember God as it is for a bee to seek honey or a flower which seeks light? ‘If I forget Krishna’s face, what use having these eyes?’ says the poet. Yet he has remembered what is essential, the love of God – so I ask, what if our eyes have forgotten? Let our hearts not forget, that should be enough. Set to Raga Jonpuri, the melody is simple and the stress is on the beauty of the words. I am indeed sorry if you do not understand Tamil for my translation does no justice at all to the beauty of the words. If you would like to know more about this raga, click here. For a contrast, listen to this version by O.S.Arun who always imbibes his music with a lot of energy. கண்கள் இருந்தும் பயன் உண்டோ ? Asai mugam marandu pochchE – idai AriDam solvEnaDi tOzhI? nEsam marakkavillai nenjam – enil ninayvu mugam marakkalAmO? peNgaLin iDattil idu pOlE – oru bEdaiyay munbu kanDadunDO? kaNNan mugamarandu pOnAl – inda kaNgalirundum payan unDO? vaNNap-paDamumillai kandAy ini vAzhum vazhi ennaDi tOzhI? Alas, I have forgotten that beloved face! To whom shall I talk of it my friend? When my heart has not forgotten the love, how could I have forgotten the face? And when I have a glimpse of a befitting face, I see not his beautiful smile. With neither rest nor speech, my thoughts are only of his love. You see how I speak ceaselessly in praise of that illusionist? Ah the sins that my eyes have committed that I have forgotten the form of my dearest Kannan! Amongst the ladies, have you seen someone as naive as me? Is there a bee which forgets honey? Or a flower which forgets sunlight? Oh my friend, is there any plant in the world which forgets the sky? 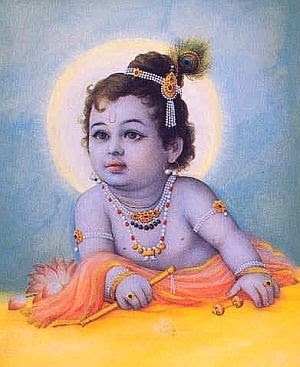 If I forget Krishna’s face, what use having these eyes? You see I don’t even have a colour portrait of Him, how will I live now? I bought Sanjay Subramanyan’s CD of the same name last year, quite excited to listen to an album full of Tamil compositions. Yet, I didn’t like the album as much as I expected. It missed something – I’m not sure what. But I loved the title track from first listening. Recently I was reminded of it by video I saw on youtube. 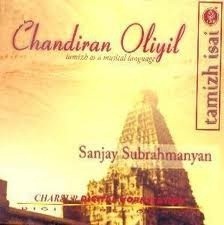 Chandiran Oliyil is a poem written by one of the greatest modern Tamil poets, Subramanya Bharathi (1882-1921). Though he often both wrote the songs and set them to music, I am uncertain about this song as I have heard versions in Raga Chandrakauns as well as Raga KeervAni. Sanjay Subrahmanyan’s version in Malayamarutam particularly pleasing. To know more about this raga, click here. The poet recounts his meeting with his Goddess (unnamed) by moonlight, saying ‘She told me to work without counting on the results, she told me to live in devotion. Thus, she has removed all affliction, she has rooted out all pain and suffering’. He also says ‘I have controlled my senses and destroyed the desire of ‘mine’ (selfishness? ego?)’. In essence, there seems to be advice lifted from Raja Yoga (control of senses, removal of desire), Bhakti Yoga (life spent in devotion) as well Karma Yoga (doing one’s duty without looking for results). The aim? The removal of all pain and suffering. Listen below to the detailed rendition (25 min) by Sanjay Subrahmanyan. I normally feature shorter renditions, given the short attention span that one has for blogs. But this is a recording of both excellent audio and video quality of an expert rendition; definitely attention worthy. The kalpanaswarams are a shower of delight; I also loved the violin accompaniment by S.Varadarajan. Neyveli Venkatesh on the Mridangam performs beautifully and the artists all share a great rapport. I saw her in a moonlit night and sought refuge in her. I have controlled my senses and destroyed the desire of ‘mine’. She told me to work without counting on the results (karma yoga? ), she told me to live in devotion. Thus, she has removed all affliction, she has rooted out all pain and suffering. She created starlight, she created the blowing whirlwind. She created the outer space, she created the joy in our hearts. 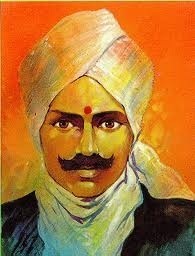 It has been in my mind for sometime to mention the poetry of Subramanya Bharathi (1882-1921). There is so much of his poetry that I like that it is difficult to decide where to start! A prolific writer of prose and poetry, he is one of the National Poets of India. He was also a Nationalist who fought for Indian Independence and a social reformer. I can not begin to say how important he is to the Tamil people; he is part of their identity. His songs are sung often in Carnatic Music concerts; they also make an appearance in Tamil films. I am sure that this wonderful poet’s work will appear again and again in my blog. For today, I have selected the song Ninnai Charanadainthen (see footnote), set to music and sung by the incomparable Ilayaraja for the film Bharathi (2000). I believe that it has been set to Raga Puriya Dhanashree of the Hindustani tradition. I love this soothing rendition by Ilayaraja, whose genius I salute. No more sorrows, no more despair, no defeats!